The faint oval above the upper left limb of the sun in this picture is known as a coronal cavity. One of NASA’s twin Solar and Terrestrial Relations Observatory (STEREO) spacecraft captured this image on Aug. 9, 2007. Scientists seeking to better understand and predict massive solar eruptions are zeroing in on mysterious cavities in the sun's outer atmosphere, or corona. These coronal cavities serve as launch pads for billion-ton clouds of solar plasma called coronal mass ejections, or CMEs. Understanding the roots of CMEs is a high priority for solar researchers, since blasts that hit Earth squarely can disrupt radio communications, satellite navigation and power grids. "We don't really know what gets these CMEs going," Terry Kucera, of NASA's Goddard Space Flight Center in Greenbelt, Md., said in a statement. "So we want to understand their structure before they even erupt, because then we might have a better clue about why it's erupting and perhaps even get some advance warning on when they will erupt." 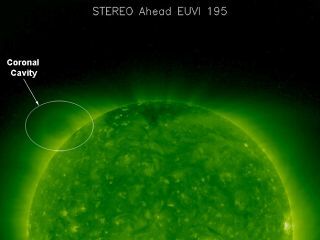 To characterize the coronal cavity, scientists used observations from a variety of spacecraft, including NASA’s twin Solar Terrestrial Relations Observatory (STEREO) probes, the NASA/European Space Agency Solar and Heliospheric Observatory (SOHO) and Hinode, a mission run by NASA and the Japan Aerospace Exploration Agency. Researchers also looked at data from the National Center for Atmospheric Research's Mauna Loa Solar Observatory in Hawaii. Together, the studies describe a structure that looks like a croissant, with an enormous tube of looping magnetic fields on the inside helping to define its shape. The cavity appears to be about 30 percent less dense than the material surrounding it, and its average temperatures range from 2.5 million to 3 million degrees Fahrenheit (1.4 million to 1.7 degrees Celsius), increasing with distance from the solar surface. The cavity's temperatures aren't significantly different than those of the surrounding solar plasma on average, but they are much more variable. Other observations of cavities show that their features are constantly in motion, creating a complicated flow pattern that Kucera and her team would like to study further. While the three papers all focus on a single cavity observed in 2007, the researchers have compared the structure to other cavities and find it to be a representative test case. More recent cavities can also be examined using high-resolution images from NASA's Solar Dynamics Observatory spacecraft, which launched in 2010. "Our point with all of these research projects into what might seem like side streets, is ultimately to figure out the physics of magnetic fields in the corona," said Sarah Gibson, a solar scientist at the High Altitude Observatory at the National Center for Atmospheric Research in Boulder, Colo.
"Sometimes these cavities can be stable for days and weeks, but then suddenly erupt into a CME," added Gibson, who is a co-author on all three studies. "We want to understand how that happens. We're accessing so much data, so it’s an exciting time — with all these observations, our understanding is coming together to form a consistent story."